“This is Light,” the Carroll Square Gallery has titled its current exhibit—though it’s an awfully small show to support a title of almost Biblical sweep. Lisa Dillin’s “Window F (blue neon)” is pleasingly minimalist—a light-blue hue of neon lighting bent into a simple 45” x 30” frame (at right). 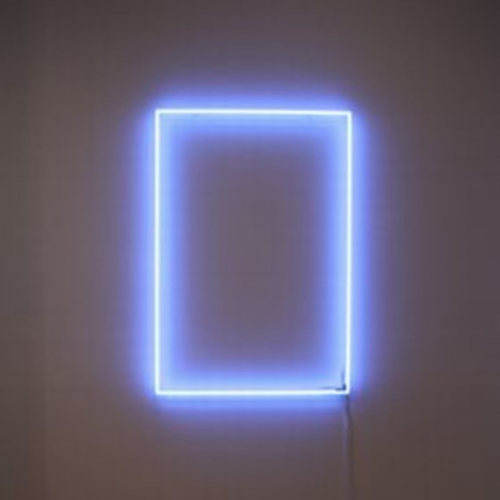 Unfortunately, its placement misses an opportunity to interact more fully with a paired work by Dillin across the room that consists of a mirror cutout, painted wood and green neon lighting. Esther Ruiz also uses neon, including a light-blue arc resting elegantly on skinny pedestals. By contrast, her smaller pieces—semicircles that suggest purse handles—look more utilitarian than graceful. Unlike Dillin or Ruiz, Pamela Gwaltney encases her light within a sheath that suggests a stylized skyscraper. It’s the only light in the exhibit to change color—it rotates through the various shades of the color spectrum—and also contrasts with most of the other sculptures by letting the light flow free-form, rather than being kept within a rigidly linear channel. The exhibit’s most intriguing work—but also the most awkward—is Tommy Bobo’s “Umbra.” The 10-minute loop video features a subject chewing bubblegum in front a slide projector. As the bubble grows, it absorbs and refracts the light from the projector, until it inevitably pops. At the brief moment when the bubble is nearing maximum size, the scene becomes pregnant with anticipation, as well as tantalizingly biological, as the form morphs into something one might see in a sonogram, if sonograms were shaded pink. At the same time, though, this near-transcendent moment is continuously, and irritatingly, undercut by the bubble-blower himself. The subject’s mouth and mustache is shown in close-up, and the soundtrack assaults viewers with a faithful recording of his chewing noises. Perhaps there is something to be said for combining the sacred and the profane, but in this work, the incessant chewing succeeds in undermining a promising sense of otherworldliness.